Baby it’s cold outside! The second of two storms is currently battering the southern half of the British Isles. While gale force winds and squally showers are battering outside, baking makes indoors warm and cosy. Especially when the aroma of these Dark Chocolate Ginger Brownies escapes from the oven. A brilliant and tasty way to warm up the day. 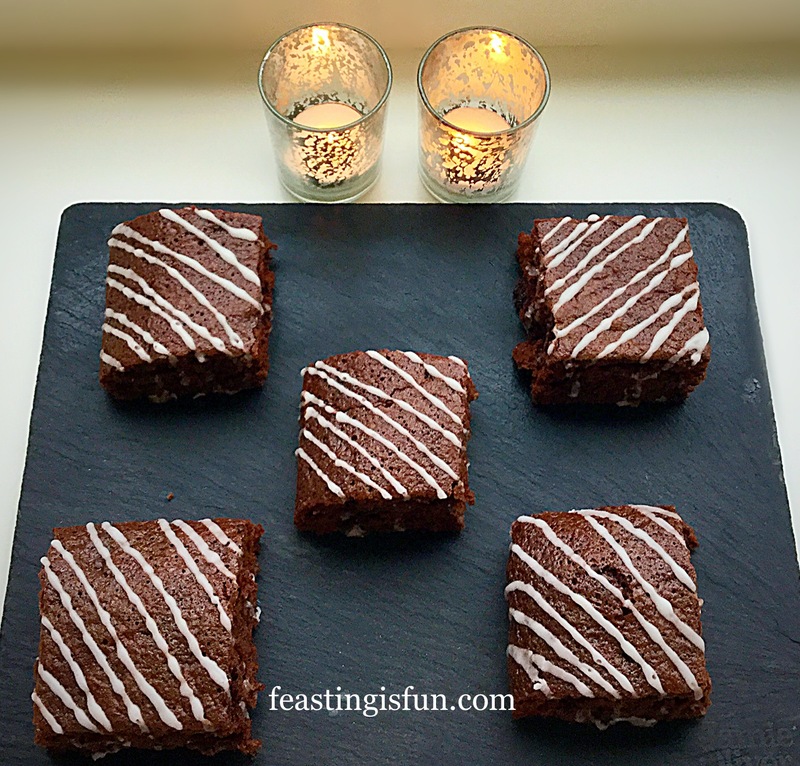 Dark Chocolate Ginger Brownies a deliciously warming treat. Since discovering Sugar and Crumbs gingerbread flavour icing sugar, I have become a little obsessed with all things ginger flavoured. 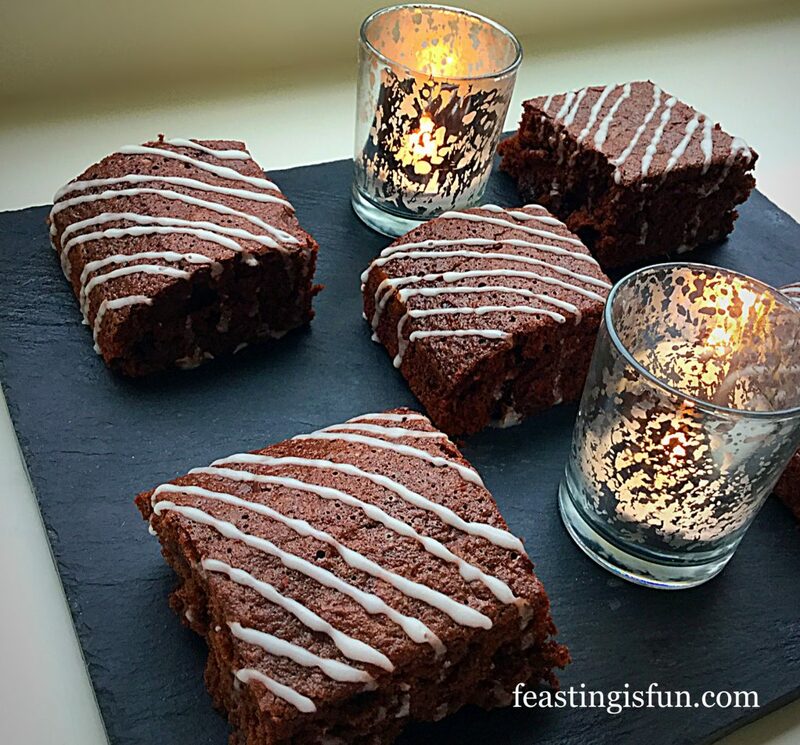 Wanting to create a winter spiced brownie, I decided to substitute the flavoured icing sugar for some of the treacly dark sugar in the recipe. Having been sent some Dark Chocolate Ginger Thins from Beech’s Chocolates, to try, I couldn’t resist adding some to the brownie batter. Resulting in a deep, dark chocolate brownie with a background warmth from the gingerbread sugar and nuggets of ginger chocolate studded throughout. 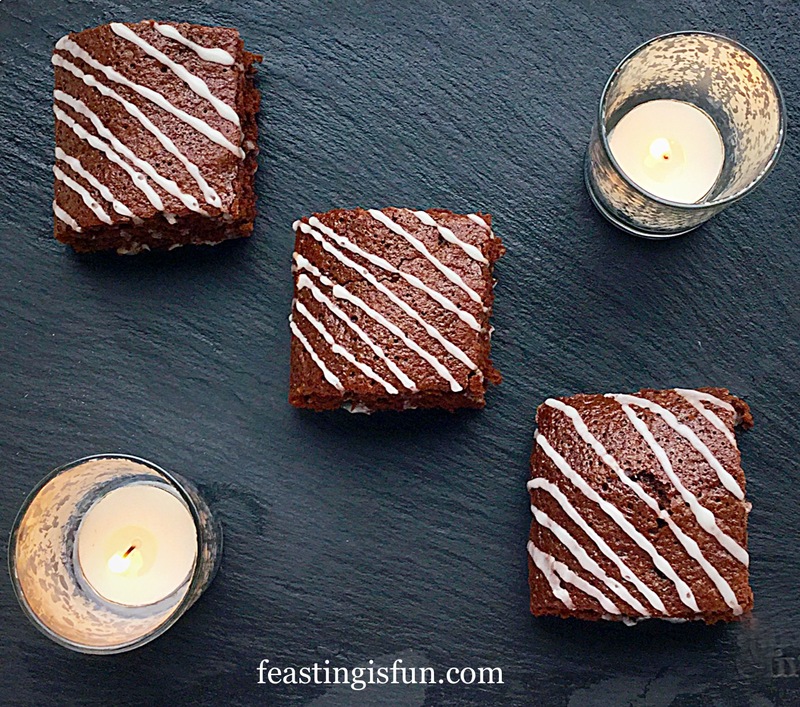 Dark Chocolate Ginger Brownies perfect for sharing. While not as dense, or fudgey as regular gingerbread and brownies, these squares are perfect as they are. Bordering on cake-like, yet not light and fluffy, these squares tick all the boxes. Sweet, but not overly so. Chocolatey, yet not cloying. Warming, without being overwhelming. Perfectly balanced flavours that satisfy with every bite. Dark Chocolate Ginger Brownies a delicious comforting treat. So easy to make and bake, these brownies also make a delicious edible gift. Ensure the icing is set, then pop a few into a pretty tin, or cellophane bag tied with ribbon. All food tastes better when shared. Homemade treats have the extra luxury of love mixed into them. Now that is something that cannot be bought! 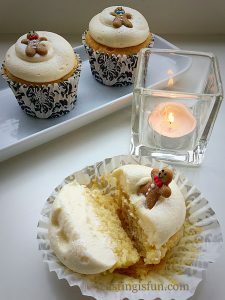 *note – if flavoured icing sugar is unavailable use 275g/10oz of D/B Muscavado sugar and add 2tsp of ground ginger to the sieved flour. 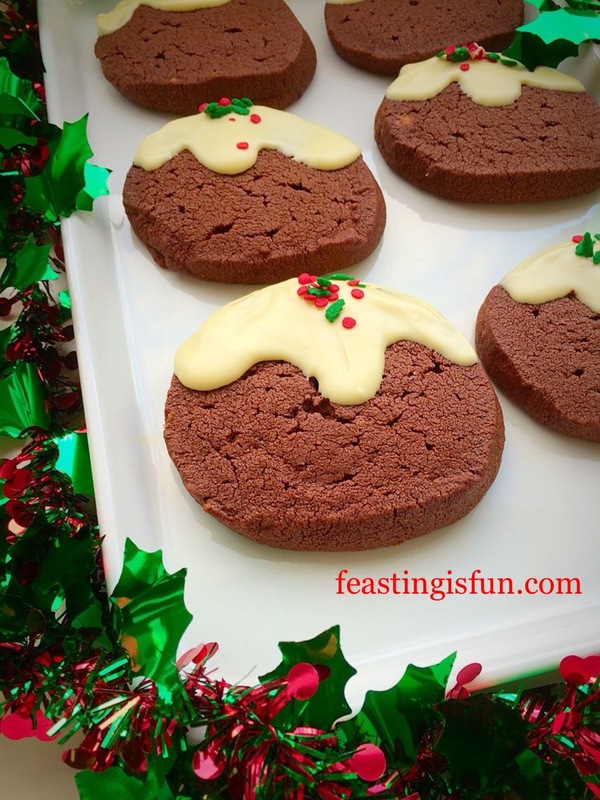 100g/4oz Gingerbread Flavour Icing Sugar – if not available use plain icing sugar. You will need a 28cm x 20cm x 5cm (12″ x 8″ x “2) traybake tin lined with aluminium foil. First add the butter, both types of sugar and salt to a heavy bottomed large saucepan. Place over a medium heat and stir constantly until the butter is melted. Take the pan off the heat and add the cocoa powder, stirring until it is thoroughly combined. Set the saucepan to one side to cool slightly. While the pan is cooling, crack the eggs into a jug, add the vanilla extract and whisk lightly to combine – liquid ingredients. Next sift the flour and sodium bicarb. into the saucepan. Stir to combine. The mixture will be quite stiff, that is normal. Now pour the liquid ingredients into the saucepan and stir thoroughly until the brownie batter is thoroughly combined. Roughly chop the ginger chocolate and add to the saucepan. Stir a couple of times to distribute evenly. Finally pour the brownie batter into the prepared tin. Give the tin a couple of sharp raps against the work top. This will bring any bubbles to the surface. 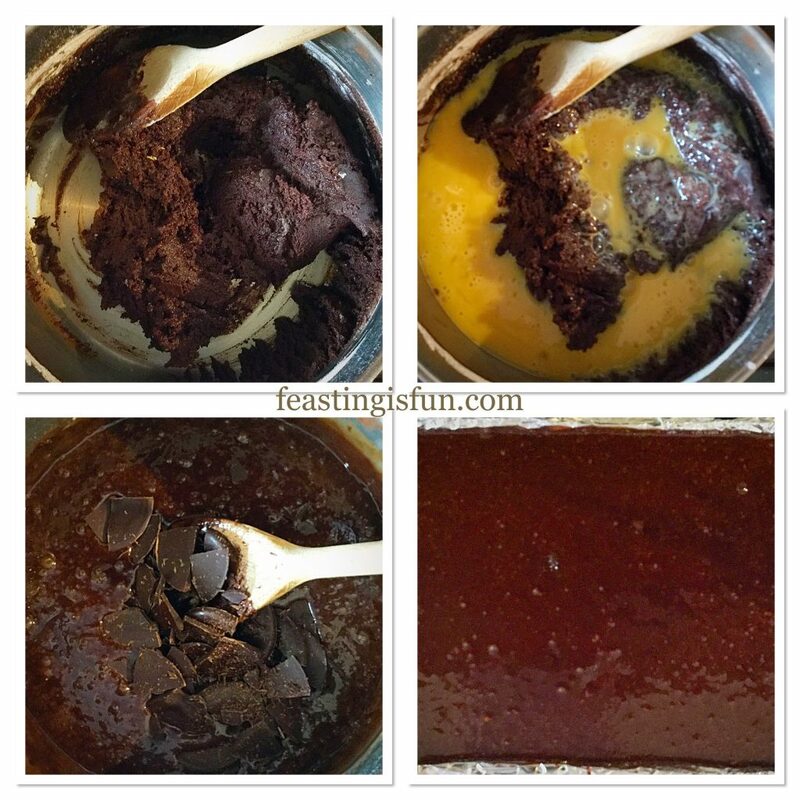 Making the brownie batter and filling the tin. Place the tin in the centre of the oven and bake for 20-25 minutes. Halfway through the baking time, open the oven door and rap the tin against the shelf. This really helps to stop the brownies becoming too airy and cake-like. 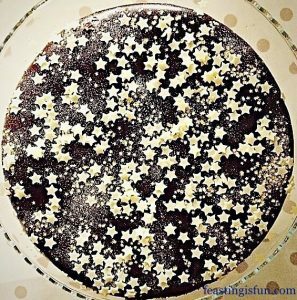 The brownies are baked when the top is set and there is not hint of wobble in the centre. Once baked, remove the tin from the oven and allow the brownies to completely cool in the tin. Dark Chocolate Ginger Brownies baked and cooling in the tin. While the brownies are cooling, make the gingerbread icing. First, sift the icing sugar into a medium sized bowl, then add a teaspoon of water. Stir, adding extra water, drop by drop, until you have a thick, drizzling consistency. Spoon the icing into a small piping bag. Alternatively, cover the bowl with cling film and you can use a spoon to drizzle the icing. 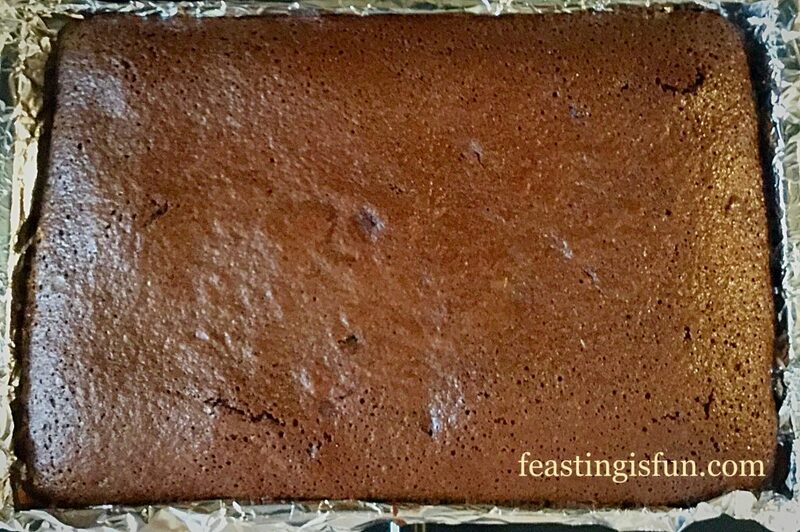 When the brownies are completely cooled, lift the entire slab from the tin, using the foil to help. Peel the foil carefully away from the baked brownie and place on to a large piece of baking parchment. Now cut the brownie into 15 equal sized squares. First cutting across the width, diving into 3 and then cutting across at 5 equal intervals to create 15 individual brownie squares. Spread the squares out so that each one can be iced individually. Next, snip the end from your piping bag to leave a very small hole. 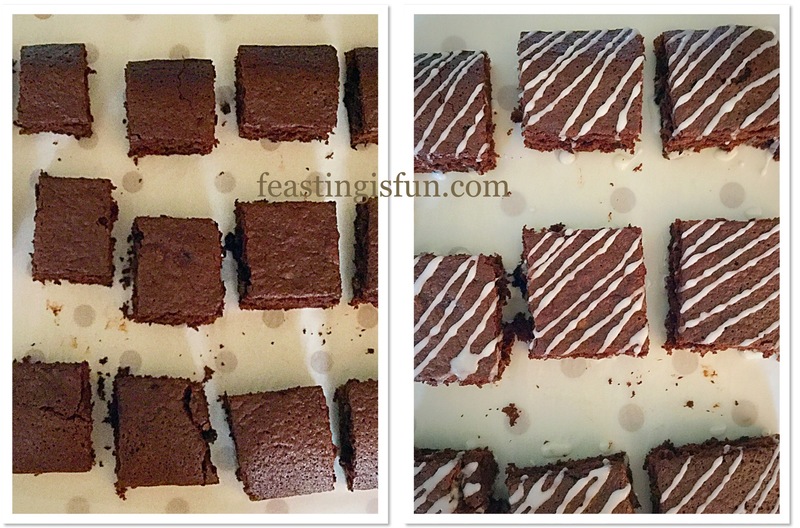 Pipe diagonal lines across each brownie, or lightly drizzle the icing using a teaspoon. Dark Chocolate Ginger Brownies finished with piped icing. Leave the icing to set before serving, or storing in an airtight container for up to 5 days. 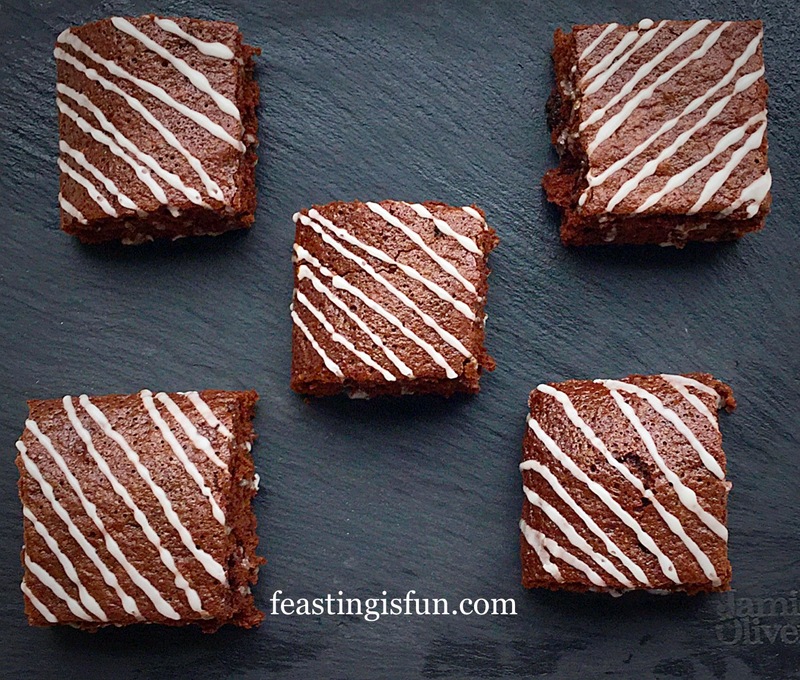 Dark Chocolate Ginger Brownies the piped icing gives them a professional finish. 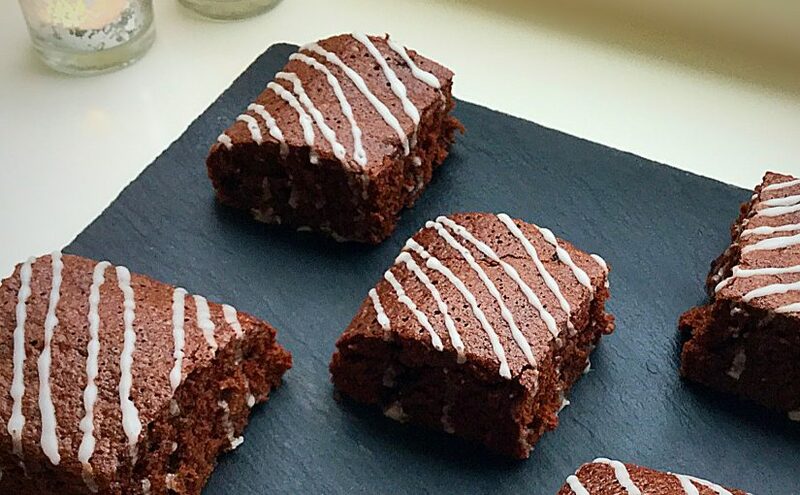 These Brownies are delicious served just as they are, with a hot drink and a smile. However, if you really want to turn them into a fantastic dessert, warm briefly (10 seconds in the microwave) and serve with a scoop of you favourite ice cream! Whether you bake these Dark Chocolate Ginger Brownies as a treat for yourself and you family, or to take into school or work to share with friends, they are sure to be a big hit. Homemade bakes taste infinitely better, unless you live close to a great bakery. Sharing our bakes shows others that they are valued in our lives. Regardless of their situation, someone has thought of them. I personally, cannot think of a better reason to get in the kitchen and bake! Whatever you are creating, making and baking in your kitchen, have fun and remember to stir some extra love in. Beech’s Chocolates sent me the dark chocolate ginger thins to try. This is not a sponsored post. All opinions, views, photographs and content are my own. Please see my Disclosure Policy.